“Yes,” Hannibal said deliberately, watching Face half reach to take the phone and then realize how futile that was. He settled down to find out what his maverick team members had been up to, though what he’d do about it depended on what it was. “Yes?” The relentless uptalk was getting on his nerves. He wanted to say, “I don’t know: Are you? Did he? Hasn’t he? Can’t you?” It stopped him from saying anything about Frankie never picking anything up again. “Okay,” Hannibal repeated and hung up into an expectant silence. “What’s happening tomorrow?” Murdock asked when Face didn’t. “You best not mean England,” BA said. “You going to ask Stockwell?” Murdock asked. “The leash chafes?” Face said. Murdock looked sharply at him at that; after all, that house on the Eastern Shore had been just exactly that: a place for things someone would notice. “Try not giving people names and phone numbers at all, lieutenant,” Hannibal said, but without bite. It still wasn’t entirely safe to snap at Face. So they all took the van in the morning, a drive marked by Face’s running commentary on the scenery and the traffic which marked his complete refusal to talk about why they were going – just as he’d refused to talk about it last night, just shrugged and stonewalled. When they finally pulled up in front of the place, everyone was relieved. Face went into the shop and came out with a 16” by 20” package wrapped in brown paper. He was holding it as though it were hot, and handed it to Hannibal as soon as he got to the van. Murdock had been wondering why Hannibal wanted them all to come, and suddenly he realized why: so Face wouldn’t be alone when he looked at this unexpected relic. Lord knew what it was, and Face hadn’t yet asked for any of the things they’d saved for him. Face felt Murdock's glance but said nothing. Frankie wasn’t – hadn’t been – much for pictures, so this probably was for his grandmother. He sincerely doubted it was anything particularly personal. The woman had said it was a special order so it couldn’t be a photo of him or them, even if there’d been one Hannibal couldn’t see. In fact, she’d called it a print, so it wasn’t going to be anything of theirs at all. Not like Frankie would have bought an art print, after all. The print was a simple black-and-white drawing, a magazine illustration at first glance. The front ends of two big old cars – 30s or 40s, one maybe a Cadillac, both with elaborate grills – were paused beside a street light. 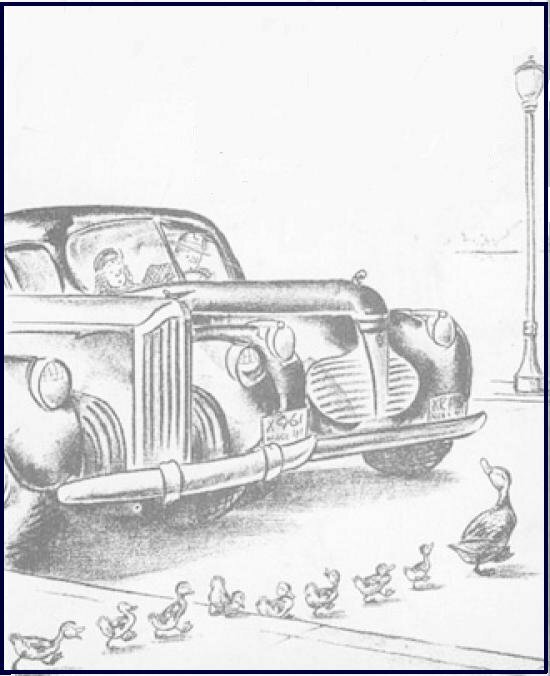 You could only see the occupants of one, a man in a fedora and a young girl or woman with a hat perched on top of her head, both staring quizzically at a duck and eight ducklings crossing the street, the duck looking at the cars with apparent disdain. “Why would Frankie spend that much money on that?” Hannibal held the print out at an angle and tilted it back, as if searching for some secret, hidden image. “It’s for me,” Face said. It was the first weekend in June… hot already, though down by the Bay it was cooler. Face was sitting on the dock overlooking the water’s edge. It had startled him to discover how much he liked to watch the birds, the herons, ducks, geese, swallows, whatever… He doubted he’d like to live here for the long term, but for the short term it was very nice indeed. “Hey. Ducks.” Frankie sat down, handing over a beer. Face laughed. It was funny now, that gander, though it had been a bit scary at the time. The thing had been big – and angry. “Mr. Mallard,” Face said, prompted by an old memory. Frankie was looking out over the water’s edge, smiling and relaxed. Face leaned against his shoulder, feeling him lean back, and looked that way himself. Six of the ducklings were paddling in the water now, while the last one scrabbled along the shore, its mother watching anxiously. Face kept his eyes on the ducklings. He hadn’t let Frankie say anything else; he cringed inside remembering how he’d physically stopped him, a hand over his mouth. “You’re already closer than I’ve ever let anyone else get,” he’d said, but how close was that, really? And how long would Frankie be satisfied with half-arm’s length? Face nodded, not trusting his voice. Frankie leaned his head down to lay his cheek on Face’s hair but didn’t say anything. “I don’t know that,” Frankie said after a few moments. He could read Murdock’s gaze as clearly as he could read the print. He didn’t understand, and he might ask later, and though family was a touchy subject between them still Face might tell him. But right now those brown eyes were saying: Of course you did. Face nodded to him, suddenly peaceful.